We’re often asked what long-term care insurance product we like the best or recommend. Our response is always, “It depends.” We’re not trying to be evasive. It just depends on each client’s health, wealth and financial goals. 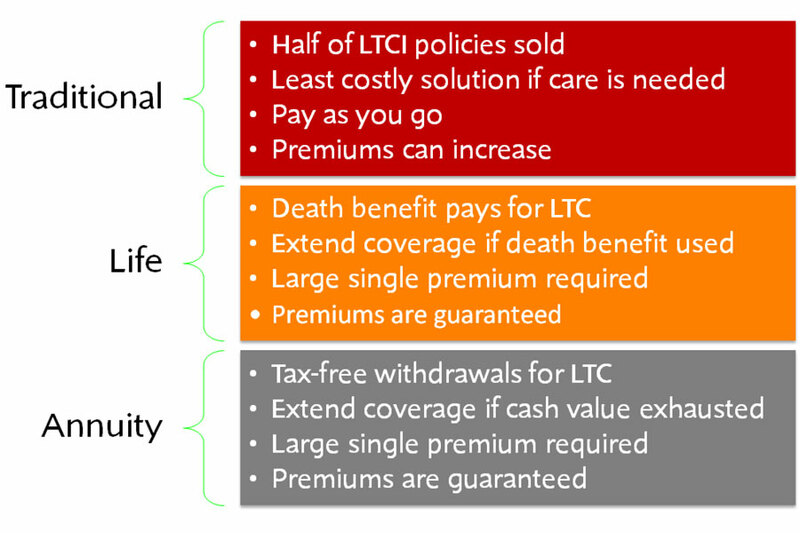 Currently, there are three long-term care insurance (LTCI) products in the market: traditional, life insurance based and annuity based. All have design variations. All have pros and cons depending on your perspective. All safeguard income and assets from the risk of long-term care expense. Some products place all the risk with the insurer. Others require the policyholder to share in the risk. Some are pay as you go. Others require a large single premium. Some require that you are pretty healthy. Others have more lenient underwriting requirements. So you see why we say it depends. Traditional pool-of-funds products are appropriate for younger, healthy applicants because the insurance company assumes all the risk. Asset-based products are designed for an older market segment and may have more lenient underwriting requirements because risk is shared between the policyholder and the insurer. Traditional pool-of-funds products are appropriate for young, healthy applicants. The life insurance and annuity based products, often referred to as asset-based or hybrids, are designed for an older market segment. About half of long-term care insurance policies sold today are of the traditional, standalone design. Think of this design as you do your auto or homeowner’s insurance. You figure out the amount of coverage you need, what you want your deducible to be and you pay premiums hoping that you’ll never need the benefits of the policy. The premiums you pay are a sunk cost. In other words, the money is gone. You don’t expect to get your premium dollars back. Most of these traditional products are designed to be tax-qualified which means benefits paid are not taxable and premiums may be deductible depending on how policyholders file taxes. These are integrated plans which cover services in all long-term care venues: home care, adult day care, assisted living, nursing home and hospice. About a dozen carriers offer these highly customizable products. Optional riders include many benefits such as a shared rider that enables a couple to share coverage and a 0-day home care elimination period waiver that covers home care services the first day that care services are engaged. These products also have a wide variety of inflation options. A traditional product may also qualify as a partnership policy providing additional safeguards from Medicaid resource reduction requirements. Most carriers offer these products to those aged 18 through 75. These products have the strictest underwriting requirements. However, a few carriers will issue policies to less healthy applicants at higher than standard premiums or with limited coverage. These policies are guaranteed renewable which means the policy cannot be canceled unless the policyholder fails to pay the premium when due. Rates can increase in a specific state if the increase is approved by the state’s insurance commissioner. However, the Society of Actuaries published a report recently that stated there was less than a 10% probability of a rate increase on traditional products sold since 2014 and later given changes in the design. If clients need care, these policies almost always end up being the least costly insurance solution. Life insurance based long-term care solutions are referred to as asset-based or hybrid products. They ride on a whole life or universal life chassis and most require a substantial single premium to fund a meaningful long-term care benefit. The premium creates cash value and also earns interest which explains the asset-based design of this product. These, too, are integrated plans and cover services in all venues. Fewer options are available to customize these products compared to traditional designs. Some carriers offer these products to those 20 through age 80. Others target an older audience of 35 through 80. Consumers who are insurance averse may like this product design because it eliminates the “use it or lose it” proposition of the traditional standalone products. We like to say, “Live, die or quit, there’s a benefit.” If you need long-term care you can accelerate the payment of the death benefit to pay for long-term care while living. If you die never having needed long-term care your estate or beneficiary(s) is paid the death benefit. Most of these products have a crediting interest rate and a guaranteed return of premium. If you quit the policy you get your premium back or the cash value whichever is greater. Many find this a more attractive long-term care funding solution. However, it is a more expensive solution if care is needed. Many insurance companies offer these products and there are two different designs. One simply uses the death benefit to pay for long-term care expenses. For example, a death benefit of $100K could be accelerated at 2% creating a long-term care benefit of $2000 per month until the death benefit is exhausted. If the death benefit is not exhausted, any remaining amount would be paid to the insured’s beneficiaries. The other design accelerates the death benefit and also extends benefits when the death benefit is exhausted. With this design there are two funding resources for long-term care expenses: 1) the death benefit and 2) the extension of benefits rider. Product designs differ. Some extension riders are purchased as separate policies and bound to the life insurance policy. Others are integral to the product design and leverage the single premium to enhance the long-term care benefit pool. These are called linked benefit products. Benefits paid from the death benefit and the extension rider are tax-free. These policies are often funded with a 1035 exchange from an existing permanent life insurance policy. Under Internal Revenue Code 1035 an individual can transfer the cash value from a life insurance contract to a long-term care contract without incurring a taxable event. Annuity based long-term care solutions must be Pension Protection Act (PPA) compliant. These annuities are medically underwritten and carriers offering these products must have claims departments and be in the business of paying long-term care benefits. There are only a few of these products in the market today. These, too, are integrated plans and cover services in all venues. As with other asset-based products, options are limited. These products are designed for an older client between ages 40 to 85 and have the most lenient underwriting requirements. A reduction of cost basis means that distributions from the policy are non-taxable and reduce the owner’s cost basis in the contract. Even gain in the old annuity is considered non-taxable if the withdrawal is made to pay for covered long-term care expenses. Withdrawals for other purposes are taxable. PPA annuities have two designs. One uses the annuity fund to pay for long-term care expenses and credits withdrawals for covered expenses at a higher interest rate than funds withdrawn for other purposes. Funds withdrawn for care expenses are tax-free. Withdrawals for other purposes are taxable. An extension of benefits rider can be added to this design to continue benefits once the annuity is exhausted. In the second design the extension of benefits component is integral to the product design and funded with a single premium. This allows greater leverage of the premium to create a more robust long-term care benefit. If clients need care, annuities are the most costly insurance solution but often the best solution for older clients with health challenges as underwriting is quite lenient. We’re really not trying to be evasive about which product we like the best and recommend. It just really depends on a client’s health, wealth and financial goals. What’s important is that all of these products safeguard income and assets from the risk of long-term care expense. If you have questions about products, cost or coverage, give us a call and let’s discuss your situation. Our exclusive focus is long-term care expense planning. It’s all we do. Long-Term Care is Double Trouble for Women!